When buying an air conditioner for a small bedroom, guest room or home office (100 to 250 square feet), look for an AC unit with a capacity of 5,000 Btu/hr to 6,000 Btu/hr. And when buying an air conditioner to cool a bigger or busier room such as master bedroom or playroom (300 to 400 square feet), you’ll want to step up to a mid-sized air conditioner rated at 8,000 Btu per hour. More: What is the best 10,000 Btu AC? An 8,000 Btu air conditioner usually costs less than $300, some expensive models can cost up to $800. But because you’ll have to spend 13% to 15% of annual utility bill on your air conditioner (according to Energy Star), so the price isn’t the most important thing to consider here when choosing an air conditioner. Before you consider price, start by determining the size of unit you need for the space you want to cool. Making sure that an air conditioner with a capacity of 8,000 Btu is the right unit. An air conditioner that’s too small will struggle to cool a room. One that’s too big cools so quickly that it doesn’t have time to remove enough moisture, leaving you with a cold, clammy space. Buy just right and you’ll feel just right and save money too. Buy an energy-efficient air conditioner provides further help in cutting down on utility costs. 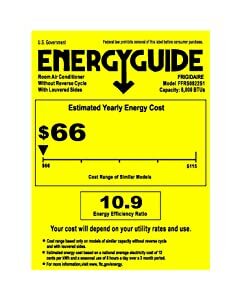 Look for a unit with an Energy Star label and an Energy Efficiency Ratio (EER) of 10 or above. An Energy Star qualified device uses 15% to 20% less energy than the units without that certification. And the higher the EER, the lower your operating costs. If you want an air conditioner to use in your bedroom, look for the models which have a quiet operation, convenient controls. The best air conditioners should come with filters that are easy to clean, a dirty filter can cause some serious problems to your air conditioner efficiency. Many good models on the market have a dehumidifying function which reduces the level of humidity in the air. Window and portable are the most common types of air conditioner rated at 8,000 Btu. Portable units are often less powerful than similarly sized window units. Portable air conditioners are also more expensive and use more energy. Portable air conditioners are intended for homes in which window configurations or building regulations prevent installation of through-the-wall units or window units. The LG LW8016ER is the best 8,000 BTU air conditioner you can buy. 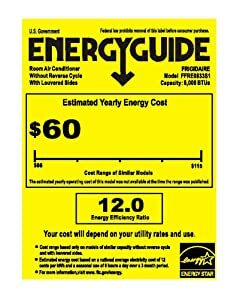 This Energy Star qualified window air conditioner will save you approximately 15 percent of annual utility bill on cooling. And this unit is one of the most energy-efficient air conditioners available. The impressive 12.1 energy efficient rating (EER) is high compared to other air conditioners. Meaning that it’s designed to use every watt effectively. This window unit is designed for cooling a room up to 340 square feet. It can move 220 cubic feet of air per minute that will cool a room very quickly. It also can remove 2.2 pints of moisture per hour, which is excellent. Most of 8,000 Btu air conditioners on the market are under 2. If dimensions are important in your choice of window air conditioner, this unit is a perfect option. While it’s not the smallest window air conditioner, it’s relatively small to fit any window size. This product is only 12.4 inches tall, 19.6 inches wide and 19.4 inches long. It also weighs only 28.1 pounds, making it one of the lightest room air conditioning units we reviewed. 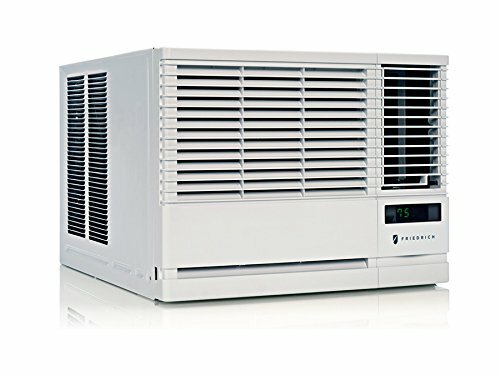 If you’re looking for an air conditioner to use in your bedroom, this unit is one of the quietest window air conditioners you can buy. Why all air conditioner in our list are effective at cooling, many of them make more noise than the LG LW8016ER. In our testing room, this unit only generated about 53 dB on low setting, while many other units generated up to 70 dB. So this window air conditioner is best for cooling a bedroom without keeping you awake. The LG LW8016ER also comes with a variety of features such as: LCD remote control, energy-saver function, sleep mode, 24-hour on/off timer. Plus, set up is a cinch with the included installation kit. 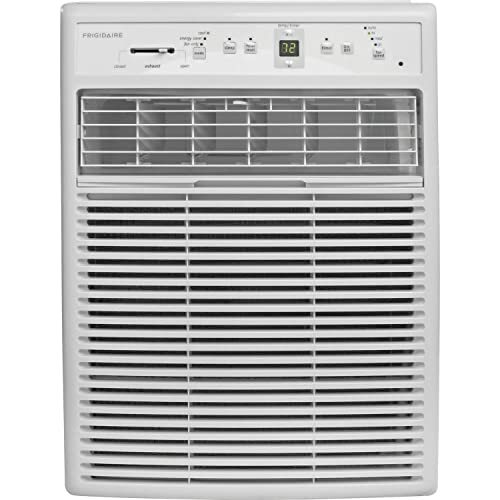 The Frigidaire FGRC0844S1 is the best smart room air conditioner and is the best-looking window air conditioner we’ve ever seen. This smart window AC can work with your mobile phone via Wifi connection and Frigidaire Smart App (available on iOS and Android). It provides you the convenience to remotely change temperature, turn the unit on & off, and create custom schedules from anywhere. This unit is compatible with Amazon’s Alexa and Google’s Assistant. You can turn it on, off, set a temperature, raise and lower the temperature by simply speaking to these devices. You can easily program your AC to run during the day, at night, during the week and on weekends. This 8,000 BTU window air conditioner meets the latest Energy Star standard and it has EER at 12.0, that means it’s a very energy-efficient unit. This unit can cool a room up to 350 square feet with 1.7 pints per hour dehumidification. It can be installed in double hung windows with openings of up to 14 inches high and 23 to 36-inches wide. Its white metal cabinet (with front panel) measures 13.5 by 19.7 by 16 inches (HWD) and weighs 53 pounds. This unit also comes with a range of operating modes such as air ionizer, sleep mode, multi-speed fan and effortless temperature control makes it easy to get the exact environment you want. The Friedrich Chill Series window air conditioner has many of the best features you’ll find on premium Kühl line, but without the premium price. Like 2 options above, this unit meets the latest Energy Star standard and is designed to cool a room up to 350 square feet. This window air conditioner isn’t as energy-efficient as 2 options above, but it’s one of the most durable models on the market that requires very low maintenance costs. It’s also easy to install and runs relatively quiet – perfect for a bedroom. Using the four-way airflow, you can evenly distribute the air throughout your room. Plus, this window air conditioning unit features a timer which lets you choose when the air conditioning unit turns on, and it can be set up to 24 hours in advance. If you’re looking for a lightweight and small window air conditioner, this unit isn’t an option. It is relatively big and heavy. It measures 18.4 inches deep, 14 inches tall and 20.4 inches wide and weighs about 64 pounds. It’s much bigger and heavier than others on our review list. The Friedrich Chill 8,000 BTU is a good product with many benefits. Although it’s relatively big, it’s still a good option to keep your home cool and help save money. The Frigidaire FFRE0833S1 is one of the most popular 8,000 Btu window air conditioners in the US. Like other models from Frigidaire, this affordable air conditioner is relatively small and lightweight. It’s designed for cooling a room up to 350 square feet. The multi-speed fan features three different speeds for cooling flexibility and the 8-way comfort control design allows you to easily control the direction of the cool air, wherever the unit is mounted. This window air conditioner is an Energy Star qualified device and has an EER of 12. This is an excellent score, as the most efficient units have a score of 10 or greater. This model’s fan noise is relatively intrusive, and there’s no drain for whatever humidity may accumulate. One of the most important things to consider when buying an air conditioner for a bedroom is the “decibel”. At 58 dBA, the Frigidaire FFRE0833S1 isn’t the quietest one in our lineup but it’s relatively low compared to other 8,000 Btu window air conditioners. Overall, with a competitive price, this unit is a decent option to buy. The Frigidaire FFRS0822S1 is specifically designed for use with sliding horizontal windows or Casement windows and is not suitable for standard (double-hung) window installation. Like other 8,000 Btu window air conditioner, this unit is the perfect solution for cooling a room up to 350 square feet. The energy-saver mode cuts costs on utility bills, and its programmable timer can be set to turn the unit on and off automatically. Adjustable side panels let this Frigidaire air conditioner fit in casement or slider windows. This casement window air conditioner maintains the preset room temperature, so you will remain comfortable at all times. It also comes with an antibacterial filter which reduces bacteria, room odors and other airborne particles for a cool comfortable environment. The multi-speed fan features three different fan speeds for cooling flexibility and 4-way air direction control allows you to direct the air where you want it. Unfortunately, the Frigidaire FFRS0822S1 doesn’t meet Energy Star standard and its EEF (10.9) is lower than our top-ranking products. But keep in mind that anything over 10 is generally considered good, so this unit is still a very good option. 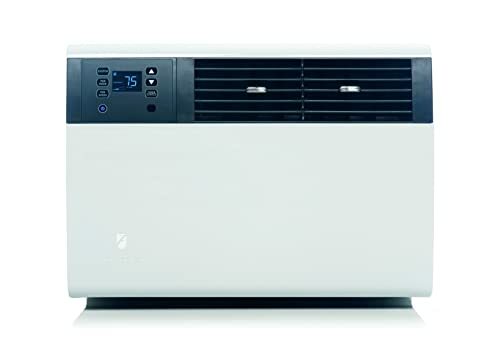 Friedrich Kuhl Series room air conditioner is a “game changer“. It’s touch. It’s durable and it’s one of the most expensive 8,000 Btu window air conditioners on its category. Kuhl is a premium line of window air conditioner which has been engineered for quiet, yet powerful operation. This window air conditioner has a solid design. It’ll look great mounted on your wall or window while offering quiet and efficient cooling. It’s an Energy Star qualified device and it’s the most energy-efficient air conditioner in our comparison with an EER of 12.2. So this unit could easily save you some money on power bills over time. The Kuhl is a smart air conditioner. The wireless operation makes controlling a Kühl possible from a smartphone, computer or tablet. Friedrichlink, a proprietary web-based portal allows access to an unlimited number of Friedrich units. Make changes on the go, wherever you are. There’re many other great features make it easy to customize your user experience based on your needs. And it also runs relatively quiet. But in fact, this window air conditioner is too pricey to buy and too heavy for an 8,000 Btu unit (72 pounds). It also can’t work with Amazon Alexa. In terms of quality, the Kuhl is an unbeatable window air conditioner. Kenmore is one of the most trusted brands in the world. And Kenmore Smart is one of the best 8,000 Btu air conditioners. Small and lightweight, it is powerful AC unit which works with Amazon’s Alexa. The Kenmore Smart is an Energy Star-qualified, 8,000-btu unit that fits windows 23 to 36 inches wide with an opening 14 inches high. It is designed to keep spaces up to 350 sq. ft. cool. This unit also has a dry setting that uses a dehumidifier to help remove excess moisture from the air. This air conditioner features the Smart AC app that lets you connect your smartphone with the air conditioner over Wifi to turn on and off, change the temperature, set schedules, and control modes and fan speeds even when you’re not home. Anyone in the house can download the Kenmore Smart AC app on their smartphone, follow the easy instructions and connect their smartphone or tablet to the AC unit. This best-selling portable air conditioner is relatively small and lightweight. It’s one of the smallest portable air conditioners in its category. This all-white sleek portable AC looks great in any room. This 8000 BTUs air conditioner works best for cooling room around 200 square feet. It also has a dehumidifier mode that removes 1.8 pints of water per hour – this feature is really helpful if you live in a humid area. This unit offers some great features such as an intuitive LCD remote control, LED display panel, 24-hour on/off timer, 2 fan speeds and 2 cooling speeds to keep the room comfortable, and having the option of switching to lower speeds helps save energy. Beyond the best-looking white exterior and many exclusive features, the LG LP0817WSR has a reasonable price. While many portable air conditioners produce horrible noises, this unit is practically silent. At only 53 dB, it’s one of the quietest portable air conditioners on the market you can buy. If you’re looking to save some cash to put towards other appliances, the BLACK+DECKER BPACT08WT may be the right choice for you. 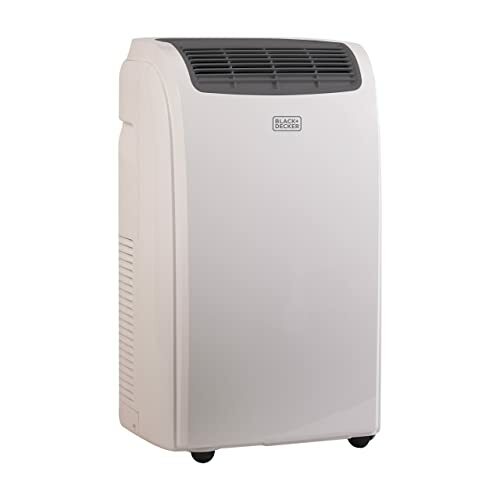 This is a good portable AC unit for a humid climate and a modestly sized room. And it’s 3-in-1 portable A/C which operates as an air-conditioner, fan, and dehumidifier. This unit comes with features such as a remote control, a timer, and a variety of modes for your convenience – including sleep mode, energy-saver mode, and dry mode. This unit comes with rolling castors and side carrying handles for easy-to maneuver mobile comfort and everything needed for an effortless installation. The BLACK+DECKER BPACT08WT doesn’t meet the latest Energy Star standard and it’s louder than our first ranking portable air conditioner. But it’s a small unit that is ideal if you are trying to save space. 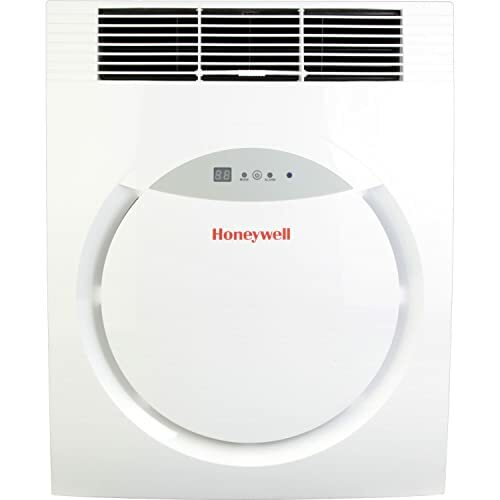 The Honeywell MF08CESWW 8,000 BTU Portable Air Conditioner, in white, is smart with a modern design, cooling and dehumidifying areas up to 250/300 square feet. With 3-in-1 technology and an environmentally friendly compressor, this portable air conditioner delivers optimum cooling and dehumidification. 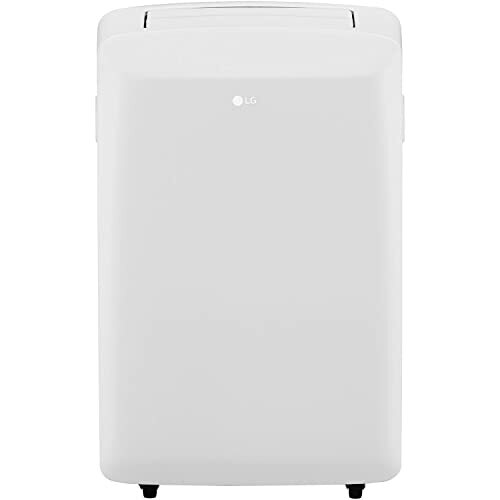 This portable air conditioner is strongly recommended for bedrooms because it’s very quiet. While many other portable AC units on the market produced up to 60 to 70 dB, this unit generated only 54 dBA – which is excellent. It will keep you cool at night and help you sleep easier. The MF08CESBB offers a flexible air-conditioning solution which can be easily set up and put into operation anywhere. It comes with everything needed including an easy-to-install window venting kit. The only requirements are an electrical plug and an outlet for the flexible air exhaust hose. While this unit has many great features, there are also things that we don’t like. This portable air conditioner isn’t as energy-efficient as it should be. It has an energy efficiency ratio (EER) at 10, which is significantly lower than others in our review list. And it’s not an Energy Star qualified air conditioner. This machine will cost you more money to operate than others. While it’s not the most energy-efficient model, it’s still a very good option for a bedroom.